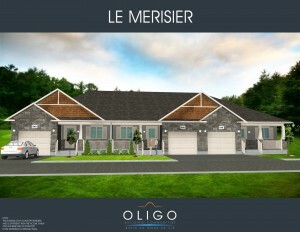 Promenade Quatre Saisons (P4s) and the lifestyle it offers is one of the finest examples of what makes living in Embrun so appealing, especially for those that want the convenience of the big city but the calmness and serenity of country living. P4S is perfectly located, only 35 km east of Ottawa, along the Castor River. The entire project is a community in itself featuring plenty of amenities, such as a tennis court, a gym, a community room, a shuffle board area, a fishing and kayaking deck, walking trails and even a picnic area with a gazebo. Imagine being able to go on foot to the grocery store, to the pharmacy, to the bank, to the nearby restaurants, and much much more. Imagine having your own special spot to explore nature along the Castor River and hopping on the bicycle path for a quick ride to Russell and back. 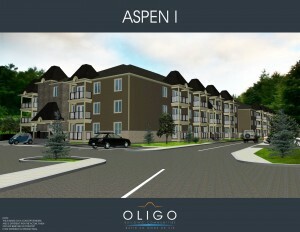 Aspen I – This low-rise maintenance-free condo building with 30 spacious units was built in 2014-15. Each unit varies in size from 778 to 1308 sq ft of modern concept living & dining with 9’ceilings and a bright spacious kitchen. There are 3 one bedroom units on each floor, some include a den and the rest are 2 bedroom units, all with a 3 piece in-suite bathroom. Each include a high efficiency in-floor radiant heat system; ductless central A/C and HRV system for maximum air quality control, underground parking and locker, elevator access to all levels, intercom system for maximum privacy and security, large balcony with BBQ connection, in-suite washer & dryer space with shelves; as well as access to all the amenities. 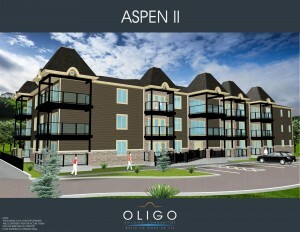 Aspen II – Unlike its twin, this condominium building has 28 units varying in size from 778 sq ft to 1803 sq ft. It has only one 3 bedroom unit on the 3rd floor and the others are either one or two bedroom units. Each unit has the same specifications as those described for Aspen I above. 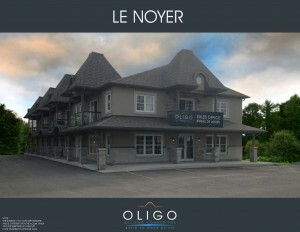 Le Noyer – This 2014 construction was built as a 9 unit condominium building with a commercial space at the front. This commercial space includes a 2 bedroom basement unit. Each unit varies in size from 1058 square feet to 1117 sq ft. Its modern living shows off a bright designer style kitchen with open concept living room and dining area; 2 bedrooms, high efficiency in-floor radiant heat system on the 2nd floors as well as a n exterior balcony, high-efficiency natural gas furnace system for units on the 1st floor, large bathroom with one-piece bathtub and lots of closet space. 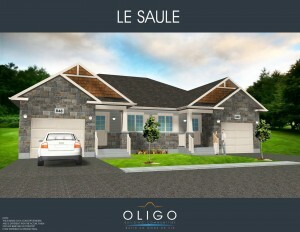 Semi-detached homes – These spacious, modern, open-living concept semi-detached bungalows are right in the middle of our project. 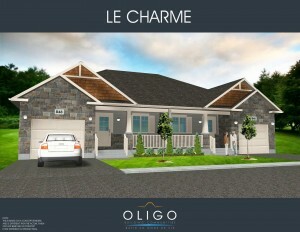 Our three models are: Le Charme, Le Merisier and Le Saule. Mouse over the plan below to see where each semi-detached is located. They all have been designed with our client’s interest in mind. They have approximately 1123 to 1242 sq ft per semi with 2 bedrooms with an abundance of closet space; 8’ flat finish ceilings, single car garage with an insulated garage door and convenient entrance from garage to hallway. Le Bouleau – retirement apartments are part of Promenade Quatre Saisons’ new project, centrally located along the Castor River, in proximity to convenient shopping, dining, green space, culture and entertainment, everything that the community has to offer, all within walking distance. These apartments will be designed with the well being of those wanting to retire in mind, finished with stunning imitation hardwood laminate floors, ceramic tiled bathrooms, a modern spacious kitchen and more. It will be your own personal hideaway that combines the vibrancy and convenience of urban living with the calm and serenity of a graceful country living. Gym facility with multi-use: Pilates, Yoga, Zumba, change rooms, etc. Reception room for multi-use: theater, hobbies and crafts, etc. Social Clubs: bingo cards, poker, pool table, etc.